An easy to prepare side dish, that goes well with Lebanese Lamb burgers and sweet potato fries with aioli to create a meal. Pine nuts are available in most supermarkets these days, try the nuts aisle or a middle eastern goods section. First toast the pine nuts in 1 tsp of coconut oil with a good pinch of sea salt. 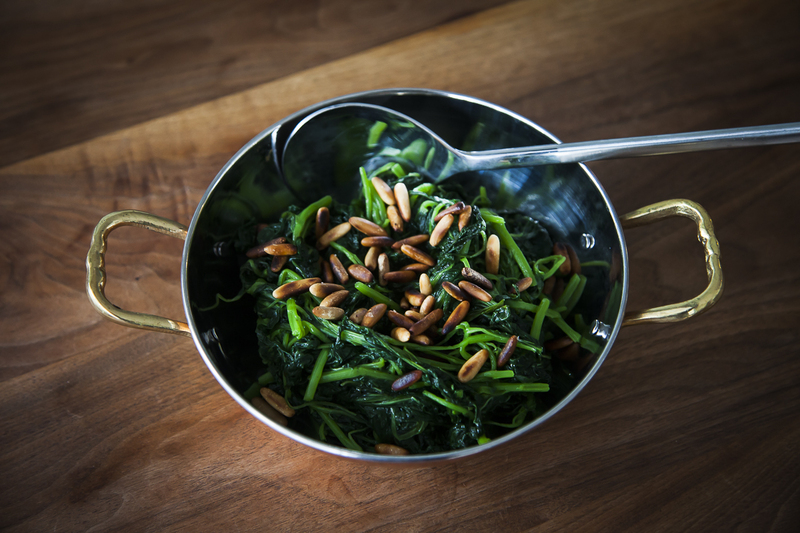 When the pine nuts are ready, set them aside and wash the spinach. Transfer the spinach to a large pan and cook with the lid on for 10 minutes until done. Drain the spinach but do not squeeze it. Heat 3 tbsp of coconut oil in a large frying pan and fry the garlic until they turn brown. Add the cooked spinach. Fry for about two minutes, transfer to a bowl and sprinkle with the toasted pine nuts.